Rudy Rummel’s motivating passion—his lifelong aversion to conflict and violence—was eclipsed only by the fierce independence born of his experience as a homeless youth from a broken family. His scholarship was characterized by his exceptionally rigorous and open-minded quest to test theoretical explanations with empirical data while explicating the associated assumptions and normative implications. His legacy, however, lives on in his example of a citizen scholar, whose commitment to take intellectual discussions beyond the academy into practice as he sought in everything he did to realize freedom and dignity with peace. Doug Bond, b. 1954, Ph.D. in political science (University of Hawaii, 1985). He has held various appointments at Harvard since his arrival as a Visiting scholar in 1988 and is now a Lecturer in Extension and Research Advisor in International Relations at the Division of Continuing Education. He previously taught at Kyungnam University in Korea. In 1996 he founded a social science consulting company (Virtual Research Associates, Inc.) that conducts applied research and field training, and offers technical support for conflict early warning systems in Africa and elsewhere. Email: doug.bond@vranet.com. 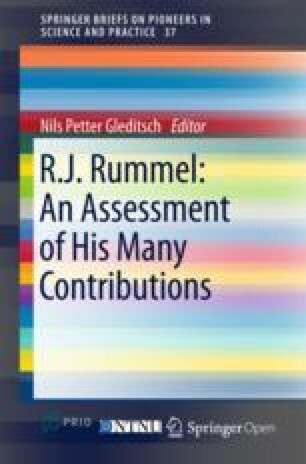 Rudy Rummel’s motivating passion—his lifelong aversion to conflict and violence—was eclipsed only by the fierce independence born of his experience as a homeless youth from a broken family.1 His scholarship was characterized by his exceptionally rigorous and open-minded quest to test theoretical explanations with empirical data while explicating the associated assumptions and normative implications. His legacy, however, lives on in his example of a citizen scholar, whose commitment to take intellectual discussions beyond the academy into practice as he sought in everything he did to realize freedom and dignity with peace. Upon learning of Rudy’s imminent retirement, I asked him if he was ill or if he was finally going to move back to the mainland, perhaps to join another university. He answered ‘no’ as he offered his explanation that began with a bit of personal history. Rudy had hearing difficulties throughout most of his adult life. By the time I met him in 1979, his hearing loss was already evident and at some point he was fitted with a hearing aid device. In those days these devices were quite crude, so the echoing of the cinder block classrooms became an increasing challenge for him into the 1990s. One day in the mid-1990s, while teaching in a large classroom, Rudy was leading a lecture-discussion using his usual Socratic method where he walked up and down the aisles interacting with the students. A student sitting at the far end of the classroom asked him a question and Rudy began to respond. However, even as Rudy responded he realized that he had not really heard the question. It was in that instant that Rudy made the decision to retire from teaching. If he could not hear well enough to interact with his students, he knew his teaching days were over. By the end of that school year Rudy retired from teaching and began working full-time on his research, writing, and interaction via his evolving website and blogs with numerous colleagues and others. Most of these communications were done via email as Rudy increasingly avoided telephone conversations and minimized his travel. Rudy taught that science had three foundations: theory, data, and norms. He explained that all three operated together, and all were required for scientific inquiry. He also reminded his students that theory was always bounded, as was data. He emphasized the inherent limitations of operationalization and in the methods of measurement and he advocated the explication of all assumptions in any analysis. Rudy was quite comfortable with the notion that all data are qualitative and some data are also quantitative. His view of scientific inquiry bridged the qualitative-quantitative chasm that has divided the academy for more than half a Century. His intellectual autobiography chapter (Rummel, 1976) was titled ‘Roots of faith’, to emphasize the importance he placed on motivating values and beliefs. Too often, Rudy lamented, the normative foundation of science went unexamined out of incompetence or ignorance, or was deliberately ignored due to a hidden agenda. Could you clarify your initial aversion … was it to violence or to conflict? It’s both. I grew up in a very conflictual family. My parents were divorced at a very early age and as a young boy I remember arguments of one sort or another between them. It’s conflict that I’m talking about here. I developed an aversion to people getting into arguments and fighting between people in what was called conflict of some sort, whether it’s violent or nonviolent. Cussing at each other, for example, was a form of conflict which I developed a strong aversion to and the aversion comes out of my youth and my family, with parents who couldn’t get along and argued constantly and subsequently got divorced with a devastating impact on me because at a young age I was on the street. I quit high school because of that. When I was of legal age, I could, and did quit at 16. So I was on my own at a very young age which, incidentally, had a great impact on me as an academic and a student because having my family destroyed under me, being left alone to do what I could for money. I actually starved because I didn’t have any food, and going through my pockets looking for bread crumbs to see if I could find something to eat, having to go fishing in Lake Erie to catch fish so I could go around to bars and try to sell it so I would have some money to buy something to eat. Having had, in other words, to order my own life so that I could survive on the street when I became a student, I wasn’t about to be pushed around by professors. So when I became an academic, I wasn’t about to be pushed around by my fellow academics or to go along with the consensus simply because I wanted to get along. So my independent streak which has been noted comes out of that early experience which is always a part, it’s a gestalt, the growing independence, the aversion to conflict, the desire to see accommodation between people and conflict while at the same time (in my mid-teens) I was learning how to get along in the world in a way that I could survive. However, I was in a dead end. I was working as a common laborer in a variety of jobs that I hated. Again, I’m by myself, no family. I joined the army when I was 18. What else am I going to do, ok? I had dreams of being perhaps an equipment operator because no one around me completed high school and nobody around me had a college education. I didn’t even conceive of a college education. So I went into the army and volunteered for Korea. I ended up in Japan in an engineering battalion. Now that experience had two incredibly important effects on me. One of which I developed as a result of growing up during World War II, viewing the Japanese as buck-tooth, monkey-like, implacable, stoic, and violent—all of this from the war propaganda that I had assimilated as a very young boy. I get to Japan and I find the Japanese very much like I am. They could cry, they could love flowers, they could play with dogs. They had a full range of emotions, a full range of desires. And as a result of that I went through a cultural shock you might say. How come we made war against these people? Now it’s one thing if the Japanese are all that they were purported to be from the propaganda that I got during World War II, if they fit the stereotype that I learned … but they weren’t. They were like you and me. It was a profound cultural shock. When I went to Japan in 1950 you could still see horrible wounds of war, and I became very anti-war. Why are we making war? We shouldn’t make war on each other. Now, this is where the violent part of my aversion came, my aversion to the violence of war. What I saw in Japan. The aversion toward conflict came in with my family experience. The second incredible impact was, by an act of God, I ended up in this engineering battalion in Tokyo which was making maps for the Korean War. They would get the data in from the planes doing the survey, then they would make the map immediately. Those maps would be sent out to divisions that needed them. I had no skills at the time. The reason I ended up in this battalion is because of how much I built up my earlier factory work to sound like it was great, so they put me down as an engineer. In any case, the people around me had college degrees. I didn’t even have a high school education. So I find myself with people with college degrees. Well, wait a minute, they are not so bright! Hey, I know more than some of these people. And I get back to the tremendous influence on my whole life in research. From this experience there percolated the idea of going to college. And then I read a book in Japan called The Professor’s Umbrella (Mary Jane Ward, published in 1948), which was about the life of the professor and that was it. I was going to go to college. Not to be become a professor, as such at that time. But none-the-less, I’m going to go to college. And so I studied while I was in Japan. I learned fractions, learned roots, and all that sort of stuff. Studied grammar, studied history and finally took the GRE exams for the high school equivalent diploma. I took those. I passed them and I had my high school equivalent diploma. When I got out of the army I applied for Ohio State University. These are the circumstances that fueled my hatred of war and why war became the focus of my early research. I saw war as the worst kind of conflict, the worst kind of violence. You have commented about science fiction. Please explain. One more extraordinary influence on me that melted into everything else was science fiction. I was on my own. I didn’t have money for movies. I didn’t have a TV. I don’t even recall if I had a radio. When I left home I went to work on a farm and in my spare time I read. I got interested in science fiction books and I really got educated through them. I developed a fascination for science. I developed some knowledge of astronomy and other kinds of science and I developed a vocabulary. That was over a six or seven year period. I read virtually everything that came out in science, virtually everything that I could get my hands on. I became, therefore, in love with science. And as a matter of fact, I felt that I could talk more knowledgably about science from what I learned from science fiction than could those with college degrees in the army that I talked to. I was in my early teens when I was into science fiction. As a result of that, when I went out to college and eventually found out that I could focus on the study of war, what an amazing discovery that was. I had no prior knowledge of that. I was first going to major in physics and math, in large part because of the science fiction. I was going to go into rocket research. However, I also found myself reading social science stuff, especially on Asia. So I transferred to the University of Hawaii because I felt I could better study Asia in Hawaii. This interest of course was developed during my stay in Japan. I could speak Japanese conversationally. I came here [to Hawaii] and had to choose a major. I was interested in Asian studies, but was advised to major in political science because I was told it would better prepare me for securing a job. I was persuaded by that. So I took political science as my major. And I found out soon enough that in the field of international relations I could study war. It was amazing. To me this was a blinding discovery in that I wanted to do something about war. I’d seen the horror of it in Japan and I thought that it was wrong for people to make war on each other. Here was a way to study it and do something about it. And so from then on, I focused on why people fight each other and what I could do about it. One of the first courses that I took at Hawaii was Introduction to international relations and the text book had a chapter on war. I learned that war was a respectable sub-major, and thereby one could focus the study of war. My first term papers were related to war in one way or another like unilateral disarmament, why we should unilaterally disarm. I thought that if we didn’t have arms, we wouldn’t have war. So my first naïve term paper, I think, was to the effect that we should unilaterally disarm. How did your aversion to conflict and war come to interact with your interest in science fiction? Science was a method. The substantive topic was violence. Violence and war in particular, was the extreme form of conflict. When you have war, you have people massacred by plan, by states and therefore, it seemed to me in the hierarchy of conflict and violence, the worst is war. I didn’t know anything about democide, except for the Jews. My aversion to conflict began when I was a young boy because of my parents. My aversion to war, which I knew nothing really about until I got to Japan and saw what was going on, came later. I became quite anti-war, and I created problems for myself as a result. Orientation sessions in the Army were conducted for the troops. They explained to us why we were fighting the Korean War. A Lieutenant would give a reason and I would say can’t the North Koreans give the same reason for fighting the war? I refused to salute the flag. I resisted these kinds of things because I thought nationalism was evil. Nationalism being one of the reasons we went to war. So as a young boy, I went through this whole route. I was an absolute pacifist, absolutely anti-war and absolutely opposed to nationalism. I was also, to a certain extent, anti-American and a dedicated socialist. I was a left-wing, anti-war type when that wasn’t a respectable thing. So, as you can imagine, I had all kinds of problems. I remained a Private first class throughout my career, except for the last months before I got out, they made me a Corporal. At what point did the cracks start appearing in this world view that perceived war as the greatest thing to be overcome? That was gradual. My view on war became inconsistent with what I was beginning to understand about war. I wrote a paper logically detailing why unilateral disarmament would not work. The field of international relations at that time was not consistent with the pacifist view. I refer here to the idea of a balance of power, the idea of war as a way of settling what diplomacy cannot, the rationalization and justification of World War I and World War II. As I began to study World War II, I could not see how a pacifist could justify allowing Hitler to conquer nations and kill people. Increasingly it seemed to me that World War II was a just war. Now if we have one just war, how can one say that all wars are bad? If we have one just war, how can one be an absolute pacifist? So I moved to the Christian position. I subscribed to the classical Catholic position on just war. Wars are evil, but if the evil that would occur if one were not to fight is greater than the evil of war, then one is justified in fighting. Can you articulate the standards that you applied to these issues? It was just change. The values were already there and what happened was an accumulation of things that were inconsistent with what I thought was the empirical world to which the values apply. For example, my anti-war stance, my absolute war stance is based on the empirical assessment of the world, of history, of how people operate. I have these basic values and the question is always how to implement them and what I see as implementation inconsistent empirically and theoretically gets discarded and I grow to accept those that seem to be a better fit with the world. Consequently I moved to accept the reality of nuclear weapons and their usefulness as a deterrent, something that horrified pacifists. I was not horrified. Now, one can argue with me that my view was wrong. We can talk about that. But an assumption that because I was in favor of nuclear weapons as a deterrent and somebody else isn’t, my values are all crooked, I think is wrong. It’s not a matter of values, it’s a matter of practice and where the practice is inconsistent with the world, then I think the practice has got to be changed. You have characterized the early 1970s as the era of your liberal education. Could you elaborate? Oh yes, that was quite an education. I took a leave from my research management responsibilities. I continued to teach. I came in one day a week for my class and I’d do the necessary decision-making on the project. I was able to take off day after day reading the basic books in the social sciences. That was a very liberal education, something I never got before to that depth. And that influenced me in two basic ways. One, my philosophy changed from positivism, I’d say almost rigid positivism, to a kind of mushy mixture of positive science on the one hand and intuition and imagination on the other. Where I saw the virtue I felt there was a virtue now to intuitive insights, to imagination, to traditional scholarship as well as science. One melds these together as a conductor melds orchestra together in producing a scientific work. That was quite a change. It’s still science. But now I relaxed and terms of my definition of science to include imagination and intuition. The second influence was that I changed from socialism to libertarianism. I was a democratic socialist, not a state socialist, not a marxist, I was never a marxist. I never believed in authoritarian socialism but nonetheless I was really a socialist, at least for a while. The reason I moved on, is that I grew to see through all the reading that I had done that socialism was unsustainable, as a doctrine or a theory an unsustainable practice. So at this point, your evolution did not include any fundamental shift in your perspective on war? My position with respect to war did not change until I did my first work on democide and that was in the early 1980s. I began to think about war differently because some of the things I came across were crazy. Like the Soviet Gulag, for example, and China under Mao. Of course I knew about what Hitler had done in Yugoslavia, Romania, Hungary, and so on but I hadn’t yet put together how many people were being killed. By 1984 or so I finished what I thought were conclusive studies on the relationship between freedom and violence. I decided to deal with these facts and do a pilot study on genocide and mass murder. I found that in this century about 110 million people had been killed in cold blood. That was an incomplete study. It was done in something like six months. On that basis I went to the US Institute of Peace for funding to do a comprehensive study. That started right away in 1986. This work was completed in 1995, and out of it came five books. My conclusion was that is war is not the worst evil: four times more people are killed in cold blood by governments than die at war between governments. That was a shock. That shook me. I had a lifetime devotion to doing something about war because I thought it was the worst evil, the worst violence and I discover that democide is the worst violence. Equally important was that the solution for war that I found is the same solution to democide. The solution of freedom was consistent with my values, the empirical evidence and theory. Is there anything else that influenced the evolution of your aversion to conflict and violence? No. It is unusual how focused I’ve been in a field where you see colleagues jump all over in terms of their research without apparently an underlying theme. For me, there was only one reason for the research that I did. I wanted to help solve the problem of conflict and violence, particularly war. Keep in mind that my single mindedness did not mean that I focused on war to the exclusion of other kinds of violence. I saw war as a part of a continuum and that to understand war one had to understand other forms of related violence such as war within societies, civil war, revolutions, and also to understand the associated conflict. So I did a tremendous amount of research in psychology and sociology. In my Understanding Conflict and War volumes I tried to articulate a theory that helps us better understand conflict as a continuum from conflict through violence which is the conflict helix. I have placed in our discussion so far an inordinate amount of emphasis on the empirical side. To me, data have to be interpreted. How do you interpret data? You have to have a theory. What is a theory? It is a formal system that can be disproven. How do you disprove it? You disprove it through by trying to make it fit the empirical world, the data. Thus, what has to come first is theory. Once you have the theory, then you collect the data to disprove it. In other words, the theory has to be falsifiable à la Popper. I saw the Dimensionality of Nations (DON) project as a way of helping to generate the theory. One of the intellectually satisfying events of my life happened at the black board in my study at home, at Yale. I had been doing the factor analysis of nations and attributes. I had conducted both monadic and dyadic analysis of nations and these were two separate things within the DON project. That bothered me. There was a tension there that had to be resolved. And it all came together when working on the black board. Mathematically I found that I could take the distances in the space of attributes as forces in the field of dyads so that the two fields were joined. The distances between the dyads became the forces. Now, this field theory was not dissimilar from the notion of distance in sociology or from Quincy Wright’s use of distance in his book on war. What was new to me was to be able to mathematically link these two spaces. From then on the DON project became one of articulating this theory, collecting the data, testing it out because the theory was that the distances in the one space would predict to conflict and war, the behavior of nations. Do you have any lessons that you would like to offer, any admonitions? Don’t assume a negative. Because so many students say don’t do this or don’t do that, and I say try to do it rather than assume you can’t. Also, I suggest prioritizing family. One’s family is essential and why I think it is so necessary to talk about gestalt. At the core of my life are my wife Grace and our two daughters. I suppose one reason for this is because my own family was destroyed, that is my mother and father. I was not going to let this happen to my daughters. Family integrity and family first remains a dominant element in my life. You can’t divorce these familial elements from one’s philosophy of science, no more than one can separate data from theory from norms. All are amorphously integrated. International relations and political science are still pre-professional. There is not a strong tradition of reviewing research, for example. That people will do research without reviewing what has already been done is an incredibly weak facet of our profession. Finally, there is a very strong intolerance of different ideas and different approaches. So many people in the field have firm beliefs that their approach is the only one or their substantive conclusions are the only right conclusions. They then attack people personally when their research findings differ. There is an absolutism in one’s own conclusions and research that ought not to be part of the scholarly or scientific field. We must all accept that we could be wrong. We probably are in many respects and let’s find out how. This interview was conducted in Honolulu, Hawaii on 4 September 1996 shortly after Rudy Rummel retired from teaching. As one of Rudy’s relatively few Ph.D. students (less than twenty over thirty years of teaching), I sought to trace the origins and evolution of his values and views and to solicit his reflections on his interaction with the community of scholarship, and also on the lessons he learned in his life. In these excerpts from that interview, I draw mainly on Rudy’s own words, editing only for readability. Parts of my introductory commentary were presented at the 46th Annual Convention of the International Studies Association, Honolulu, HI, in March 2005 at a panel celebrating Rudy’s life work.